Recently, a wrong-way driver collided head-on with another vehicle on I-95 South in northeast Philadelphia, killing two people. The fatal two-car accident happened during the early morning hours between Woodhaven and Academy Roads. Pennsylvania State Police continue to investigate the crash. Also in the news a few weeks prior, commuters were purposefully driving the wrong way on the Schuylkill Expressway to avoid a major accident. Helicopter cameras filmed drivers going the wrong way down a ramp, and some even turned around on the expressway itself. As head-on collisions are among the most serious motor vehicle accidents, resulting in the most serious injuries, there’s nothing right about driving the wrong way. Rather, it’s always an accident waiting to happen. According to the Federal Highway Administration, wrong-way car accidents cause between 300 and 400 deaths each year. In fact, the fatality rate for wrong-way accidents is 12 to 27% higher than all other types of motor vehicle collisions. If a wrong-way accident does not result in death, the injuries drivers and passengers sustain are often extremely severe, requiring surgery, long-term medical treatment, and rehabilitation. 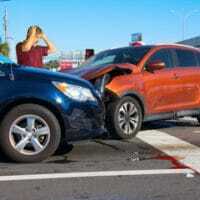 A few driving strategies can help you avoid being involved in a wrong-way car accident. For example, the National Transportation Safety Board found that seven out of nine wrong-way accidents occur in the traffic lane closest to the median, which means driving in the right lane is safer than driving in the left lane where there’s a high risk of wrong-way driving. And, of course, staying alert, focused, and avoiding distractions helps avoid all types of motor vehicle accidents. If you do see a wrong-way driver on the road, report the vehicle as soon as possible by calling 911. So that we may all be safer on the roads and in the community, drivers must behave responsibly when they get behind the wheel and take responsibility when they do not. If you have been injured or lost a loved one in a car accident in the Chestnut Hill-Philadelphia area, please contact Benedum Law to discuss your rights and options for recovering fair compensation. We take personal injury matters personally.